Thanks to diligent research, eyewitness testimony, and Fourth Air Force documents, we now know that UFOs were present at the dawn of the nuclear age. Or at least they were caught snooping around the plutonium factory near Hanford, Wash., between December 1944 and January 1945. Security pickets surrounding the top-secret development of the world’s biggest bomb were concerned enough to redeploy searchlights, radar, and interceptors in hopes of putting a stop to the overflights. This is not where Robert Hastings’ independently produced 45-minute documentary “UFOS and Nukes: The Secret Link Revealed” actually begins (see excerpt below). De Void mentions it only because Hastings’ video treatment – based on his 2008 book, UFOs and Nukes: Extraordinary Encounters at Nuclear Weapons Sites – is merely the introduction to an exceedingly weird and complex story, at least 70 years long and counting. Yet, within that introduction, augmented by archived footage, vintage news clippings, federal documents and on-camera interviews with 15 veterans or contractors, Hastings provides the sort of context that only flat-liners or hard-core ostriches could dismiss with a shrug. “Saucer Visits A-Bomb Site,” “Two Jets Reported in Saucer Pursuit Over Los Alamos,” “Flying Saucer Reported at Site of H-Bomb Plant” – from the Nevada Test Site to the Pacific Proving Grounds, back when the military was nominally more candid with the press than it is today, blurbs about unauthorized surveillance were cropping up in newspapers across the U.S. Hastings, as readers of his book are aware, is interested in the guys inside the wire, the Cold War missile-site veterans. Decades removed from active duty and possible retaliation, they discuss not only what they saw, but how they were told to keep their mouths shut about it. But Hastings puts the aging and now uninhibited eyewitnesses on camera, and their stories are often dramatic. Take retired Maj. Gaylan King, whose strike team at Ellsworth Air Force Base in South Dakota, responding to a security warning in 1966, saw an object throw a red beam of light onto a subterranean silo. “I assume they were taking data with that beam, it wasn’t destructive as far as I know,” King recalled. “It had to be a data collection thing, I’m sure they scanned a warhead or something.” Or former Capt. David Schindele, same year, reporting how UFOs took a flight of missiles “off alert” at Minot AFB in North Dakota: “This was a very serious incident.” And in an audiotaped interview, former first lieutenant David Shuur related how – also in 1966, separate incident – one launch-control console at Minot showed a missile in countdown mode during a flyby. The recorded testimony and/or notes of four men responding to the 1967 shutdown of 10 ICBMs at Malmstrom AFB in Montana bluntly repudiate the assurances of USAF Blue Book boss Maj. Hector Quintanilla, who declared the phenomenon “does not present a threat to national security of the United States.” But it wasn’t just the U.S. in denial. “UFOs and Nukes” touts post-Soviet documents and testimony underscoring the hair-raising incidents unfolding half a world away, including a launch-sequence activation in Ukraine attributed to UFO activity. Stylistically, what sets this narrative apart from many others that too often resort to sensationalist bells and whistles is its evenly modulated presentation. True, there are re-enactments included, and the CGI employed here took a major share of the $145,000 production budget. But they’re judiciously employed and not nearly as distracting as the spectacular failures that characterize so much standard cable fare. Maybe it’s impossible to put together a documentary on The Great Taboo without relying on special effects. National Geographic used CGI with great precision in 2010 to get a handle on the Phoenix Lights phenomenon of 1997. At any rate, Hastings gets a lot of mileage out of a shoestring. 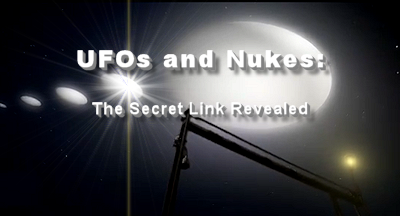 Again, much of “UFOs and Nukes” covers territory that many will find familiar. But ultimately, the documentary isn’t for that crowd. Hastings is looking for even more military eyewitnesses, and he closes the show with his website contact. Getting this project to large and diverse audiences is the obvious challenge. But if it can persuade silent veterans to contribute additional missing pieces to this puzzle, maybe that will generate the kind of noise not even corporate media can ignore.